Why Choose a Wedding Chapel in Las Vegas? All the rental items from tables, linens, lighting to dance floors to complete your wedding. Las Vegas wedding rental companies have everything you need to complete your special occasion. Tables, chairs, linens, table ware, dishes, even the glasses you'll need so your guests can toast to your happiness. 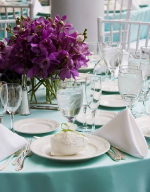 No wedding reception is complete without amazing linens to set the tone. Today's Las Vegas weddings are also using ambient lighting and vintage marquee lights to create extra dazzle and romantic moods. Our very first farmhouse table began with love, and ended with the idea of your picture perfect wedding. Each table is handcrafted by husband & wife Brad & Pam, to add a touch of magic to your special day. 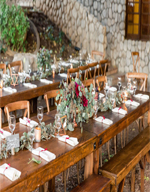 Rustic benches & chairs bring your fairy-tale wedding to life. Nevada's largest selection of party equipment! Find out why RSVP is the best place to rent tables, chairs, tents, linens, china, dance floors, chafers plus all of your party and wedding supplies in Las Vegas. Milestones deserve a special celebration, from weddings to holidays to birthdays. No celebration is complete without a cocktail to enjoy. The makers of the Grand Rita understand this and felt that the cocktail deserved a central role in any celebration. Jovani Linens offers personalized and professional service with many years in the hospitality industry. We take pride in our company, and look forward to helping you plan your event. Our linens are manufactured with only the highest quality fabrics. Leave the details to us and allow your event to be worry free. LED Unplugged offers the NEWEST TRENDS in lighting and lounge concepts, as well as MARQUEE LIGHTING and the most technologically advanced wireless LED-lighting on the market today. See how we can transform your event into something simply breathtaking! Visit our showroom where we can demonstrate the lighting live! I'd like this company to call me. I'd like to receive info from other service providers.